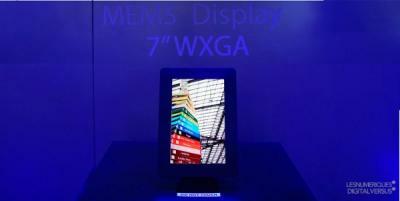 Sharp was showing their 7" MEMS displays at CES 2014, promising MEMS based tablets on the market within six months. Those same prototypes were unveiled a few months ago at Ceatec 2013 in Japan. MEMS-Shutter displays are similar to LCD in that they have a LED backlighting unit (BLU), color filters, and a component that blocks the light. But instead of liquid-crystals and polarizers, these displays use MEMS shutters. Sharp's 7" prototypes feature a resolution of 1280x768 and are made on IGZO substrates. Sharp claims that MEMS displays will feature ultra-low power consumption but will yet offer excellent image quality and color - in fact Sharp says the color gamut is better compared to 'standard' LCDs. Sharp sees these displays competing with OLEDs, but they will be a lot cheaper.